His trousers are perfectly fine. Fellow Americans: leave your laundry at home, not around your ankles! This is the kind of man whose name should always be preceded with a Mr. But, even though he seems classical, he hits you with those pants, which are a wonderful twist. I love them. The shorter length, regardless of whether its in or out, just looks sooo good. I wish I could get my hair to do that! What a sense of style. Mmmmm, thanks Sart (yes, sometimes you specialize in pin-ups)! I love the hair– long, but beautifully cut, in great condition. Nothing shaggy about him. And windowpane checks! my fave. Great personal style all around. The most important aspect of the trouser is not that there is no break or that the cuff is 2″ it is the taper of the leg combined with the other elements. 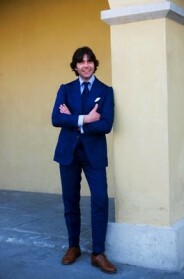 If you notice the Italian man who wears no break is also comfortable wearing a trouser with a taper most American men would shy away from because it is a big difference from the boring straight leg trouser. If you were to pair the big cuff with no break on a straight leg trouser it does not look the same as with the slimmer fit tapered trouser. I particularly love the mix of a soft shoulder with a “roped” inserted arm-sleeve. Very purposeful and wickedly elegant. By the way, shorter trousers for these gentleman would never enter their mind as being “stylish” – this is how their father / grandfather etc. dressed. It just is. H.A.W.T., but his pants might be a tad short. Some of you speak of the “italian cuff.” The reason it is a bit “thicker” these days is due to the fact that the pants are worn shorter. In a few years when the pants need lengthening and the flood style is gone one will be able to drop them again and wear them. Function. The very masculine cut of his clothing contrasted with the softer line of his haircut, again contrasted with his angled sideburns make for a gorgeous package. 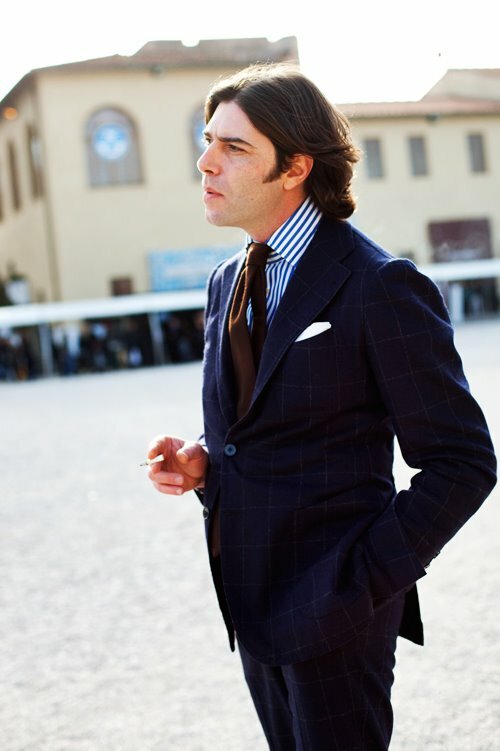 Love the windowpane jacket/trousers with the striped shirt. Everyone, the shorter pant cuff is a European fashion. I was dressed like that as a child and made fun of in US schools. i often complain about the fashion here, that it leaves me cold. This is wonderful. this is a great pic! he’s got a great style! While shorter pants can look funny, longer pants are never smart, not even close. 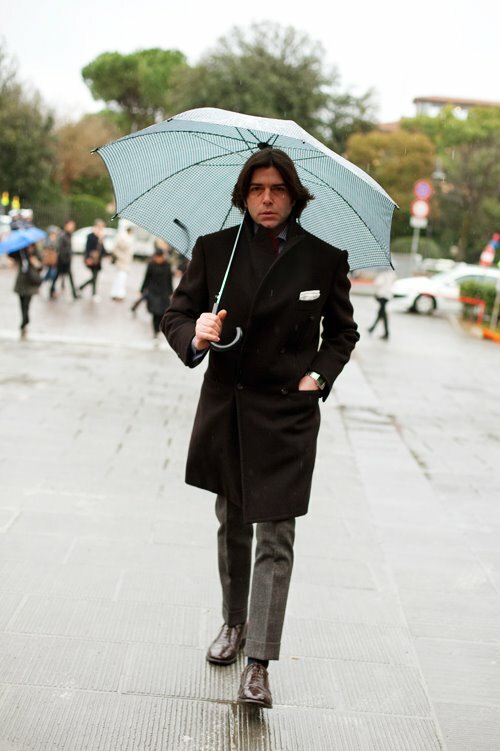 It is getting the right in between length that constitutes the balancing act of male elegance. And yet, those who fail on the short side are still smart. Those who fail on the other end, well… well earned their patronage of the Gap. Handsome! Gotta love a gentleman. he could totally be alan rickman as severus snape. only without greasy hair and better dressed. Why don’t men in Australia dress like this? profile looks like Benicio Del Torro – am I right?! I’d like to dress like this. Dandified, yet understated. Great suit in photo 1, beautiful fit. However look at this man’s skin he is smoking his way to ill health. Such a shame! 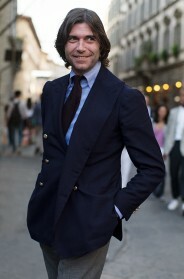 Mr. Valentino Ricci has classic, tailored style. He is such a Retro Gentlemen in a clean and refined way. Checkout some of our Retro Gents … some are refined and others rustic … either way … they rock classic style in their own way. I think he looks absolutely perfect, more pictures of him please! !